Lewis Hamilton took his third pole position of the season after dominating the unique twilight qualifying session at the Yas Marina circuit. The McLaren driver set the fastest time in all three sessions and proved unbeatable in Q3 with a margin of 0.7 seconds over his Red Bull Racing rivals. It would have been an all-McLaren front row following the team’s impressive practice pace but alas the poor luck that hampered Heikki Kovalainen’s season continued with the Finn forced to pull out in Q2 with a transmission fault. At one point he was third but come the end, he slipped down to P13. Red Bull’s Sebastian Vettel and team-mate Mark Webber will start the inaugural Abu Dhabi Grand Prix in second and third respectively with the constructors’ champion Brawn GP next up. The new world champion Jenson Button could only manage fifth and was once again out-qualified by his team-mate Rubens Barrichello. Toyota’s Jarno Trulli was a contender for pole in the early stages of Q3 but found himself demoted down to sixth by the end. At least the Italian will be satisfied to start the race ahead of the BMW Sauber pair of Robert Kubica and Nick Heidfeld. The team will be taking part in its final Grand Prix from the fourth row. Nico Rosberg lines up in ninth position in his last appearance as a Williams driver with Toro Rosso’s Sebastien Buemi completing the top ten. Neither Ferrari made it into the top ten – making 2009 the first season since 1993 that the team has not managed a single pole position. Kimi Raikkonen will start his final race as a Scuderia driver in P11 way ahead of his team-mate Giancarlo Fisichella, who was the slowest of all in Abu Dhabi. The Italian team will have a tough situation to finish third in the constructors’ championship with only a two- point advantage over rival McLaren. But if you thought Ferrari had a bad session, it was a nightmare for Renault. Fernando Alonso could only manage P16, which was not the ideal position to sign off his seven-year stint at the team. His team-mate Romain Grosjean also struggled and will start in a lowly P19, behind the disappointing Force Indias. After a difficult second half of the 2009 Formula One World Championship, Jenson Button has finally fulfil his dream ambition in winning the drivers’ title after an aggressive drive in the Brazilian Grand Prix. Starting in P14 after a frustrating qualifying session, the Brawn GP driver pulled off some impressive overtaking manouvres to land fifth spot in the end. This was enough to secure the championship. It capped off an amazing season and Jenson has undoubtedly silenced his critics whether he fully deserves the drivers’ title following this thrilling Grand Prix, won by Mark Webber. The result also gave Brawn a remarkable Constructors’ Championship title in the team’s first year, less than 12 months after Honda’s departure left its staff facing an apparently bleak future. As for the winner of the Brazilian Grand Prix, this was a comfortable victory for Mark Webber. The Australian took the lead after the first round of pitstops and never look back. Behind the victorious Red Bull, Robert Kubica took his best result of the year in second for BMW while Lewis Hamilton came through from the tail end of the field to take third for McLaren. For Rubens Barrichello, who started his home Grand Prix in pole position, the Brazilian’s crude luck at Interlagos continued. Even though Rubens had the opportunity to take the championship down to the wire if he wins, his mid-race pace wasn’t enough to prevent his team-mate in taking the title. A puncture eight laps from the chequered flag while running in fourth ending his chances. As for Sebastian Vettel, who started alongside his title rival in P15, the German drove his heart out in the 71-lap Grand Prix but fourth was not enough to keep his title bid alive. The opening lap was quite dramatic with Vettel making contact at the Senna S with Heikki Kovalainen, who spun his McLaren and was almost collected by Giancarlo Fisichella, who took avoiding action in the Ferrari. Both were able to continue but at the tail end of the field. Kimi Raikkonen was also involved in the chaotic first lap when he broke his front wing against the back of Webber’s Red Bull as the Australian defended his position into the Descida do Lago. Through the next corner Toyota’s Jarno Trulli went wide onto the grass – accusing Adrian Sutil of putting him there – and spun back across into the Force India, which was then collected by the Renault of Fernando Alonso. All three were out on the spot and prompting a safety car. There was even more drama under the yellow, as Kovalainen took the McLaren fuel hose with him as he left the pits, resulting in a flash fire as fuel splashed out of the hose onto Raikkonen’s close-following Ferrari! Remarkably both were able to continue without delay. As the race stewards began investigating all of those incidents, Button and Vettel found themselves ninth and eleventh in the restart queue, with Barrichello leading the race over Webber, Rosberg and Kubica. Both Button and Vettel immediately charged forward with some aggressive passes, before getting stuck behind Kamui Kobayashi’s Toyota and Kazuki Nakajima’s Williams in seventh and ninth respectively. It took until lap 24 following several near-misses before Button successfully dived inside Kobayashi at the Senna S. By that time his title prospects looked much better, for Barrichello had fallen from first to third after the first pitstops. The Brawn had only managed to pull two seconds clear of Webber, and when Barrichello stopped on lap 20 he emerged into the thick of the traffic and was further delayed being overtaken by Vettel. He not only lost out to Webber, but also fell to third behind Kubica, with Rosberg losing a chance to also get involved in this fight when he retired on lap 26. That settled the lead battle for the rest of the race. Webber ran a comfortable five seconds ahead of Kubica, with Barrichello becoming an ever more distant third. The Brazilian’s only hope of keeping the title fight alive was now that Button finished eighth or lower, but the Briton’s excellent progress continued as he moved up to second before making the first of his two stops on lap 29. Vettel ran a similar strategy but pitted even later, which enabled the German to jump Button at the final stops, but by that time they had moved up to fifth and sixth – which was not enough for the Red Bull driver but it was perfectly adequate for Jenson in the Brawn. Just to underline that Barrichello’s task was hopeless, he was passed for third by Lewis Hamilton ten laps from the end, then fell to eighth with a puncture – no thanks to a brush with the McLaren – two laps later. Hamilton had pitted under the safety car to immediately get rid of his soft Bridgestone tyres, meaning he could run the rest of the race on a one-stop strategy. He then had the pace to quickly move through the field, keeping up with the lighter-fuelled cars, and emerging fourth behind Barrichello as others stopped. Behind Vettel and the euphoric Button, Raikkonen recovered to sixth, with Sebastien Buemi scoring two points for Scuderia Toro Rosso in seventh. Kovalainen finished in ninth, with Kobayashi losing ground as others around him ran longer strategies, but pushed past Fisichella for tenth in the closing laps. The Toyota rookie escaped a frightening incident with compatriot Nakajima – who he had already banged wheels with through the Senna S – that saw the Williams have its front wing swiped off on the rear of Kobayashi’s defensive Toyota as it came out of the pits. Nakajima lost control on the grass and speared into the Descida do Lago barriers, but was unhurt. So, congratulations to Jenson Button and the Brawn GP team in winning the title. For Button, this was a dream come true and he becomes the tenth British driver to taste success as the world champion. What is ever more remarkable is that Brawn GP has achieved the constructors title in its first-ever season. Credit to the all the members at Brackley and especially Ross Brawn in leading the outfit to championship glory. Next race: Abu Dhabi, Yas Marina Circuit. October 30-November 1. After nearly three hours of persistent rain delaying the qualifying proceedings, Brawn GP’s Rubens Barrichello ultimately secured a crucial pole position at home while his title rivals suffered major problems in the tricky wet conditions. World championship leader Jenson Button will start the Brazilian Grand Prix down in P14, having opted not to fit the Bridgestone intermediates tyres that could have vaulted him up the grid order. By staying out on track with full wets, Jenson lost the opportunity in setting a competitive laptime. Position fourteenth is not ideal but at least it is no worse than Sebastian Vettel. 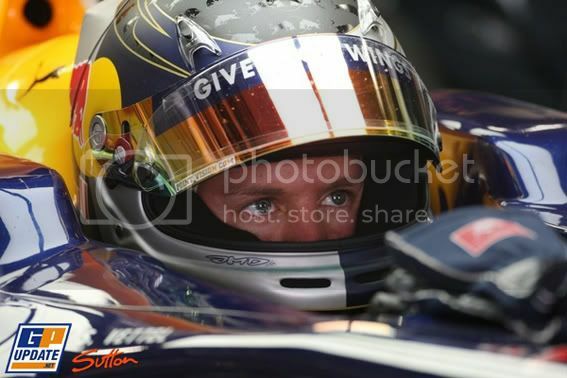 The Red Bull Racing driver will start in P16 and will need at least second place on Sunday to remain in the title hunt. Mark Webber joins Barrichello on the front row in the second Red Bull, ahead of another impressive qualifying effort from Force India’s Adrian Sutil in third. The first qualifying session was red flagged after just four minutes following a spin by Giancarlo Fisichella in his Ferrari. The Italian lost control at the bottom of the Senna S and stalled on the racing line. He will start the race at the tail end of the grid. With the conditions near impossible due to the heavy rain, race control decided to halt the session until the weather relented at least slightly. As the skies became a little lighter, Q1 was restarted following a 12-minute pause, and although the spray and standing water remained a major issue for the drivers, the lap times were immediately 12 seconds faster than the pre-red flag laps. Outside championship contender Vettel had been fastest by a full second among the seven cars that set times prior to the stoppage, but he was quickly shuffle down the order to P16 and could not improve. A trip off the circuit at Turn 5 did not help, and with the rain coming down harder again Sebastian abandoned his final lap. P16 is his worst-case scenario and the German faces a near-impossible task in Sunday’s Grand Prix as he strives to stay in title contention. Also going out in Q1 were the McLarens, with Heikki Kovalainen and Lewis Hamilton in P17 and P18 respectively. The latter having a spin after exiting Turn 5. The start of Q2 was delayed further as the rain continued to fall. Despite no obvious let-up in the conditions, the green light appeared and the remaining 15 cars headed onto the track. But in no time at all Vitantonio Liuzzi had a huge crash on the pit straight, bringing out the red flags once again. With the rain continuing to fall it took an hour to get the session restarted. But when it finally did it brought a dramatic development – championship leader Button was eliminated. The track began to dry quite quickly and halfway through several drivers switched to intermediate tyres – led by Nico Rosberg’s Williams, who once again looked instantly at ease with the wet conditions. Neither of the Brawn GP drivers opted to try the intermediates and that proved a big mistake in Button’s case. But while Barrichello managed to scrape through to Q3, team-mate Button was 0.9 seconds slower and thus failed. He will start behind rookies Kamui Kobayashi – making a fine debut for Toyota – Jaime Alguersuari (Toro Rosso) and Romain Grosjean (Renault). And so into the final ten minutes of Q3. With the track conditions improving all the time and the rain finally easing off, the top ten drivers all opted for the intermediates to set the quickest laps. The pole position holder was changing at least once every minute with Sebastien Buemi, Robert Kubica and Jarno Trulli all having turns. Twice Barrichello took the top spot but immediately was pushed back down the order. He eventually took the honour when the chequered flag was waved on the main pit straight, recorded his first pole position at the Interlagos track after five years of trying. His time of one minute, 19.576 seconds was just under a tenth of a second faster than rival Mark Webber. Adrian Sutil grabbed third from Toyota’s Jarno Trulli right at the end, with Kimi Raikkonen fifth for Ferrari. Toro Rosso’s Sebastien Buemi was rapid throughout and took an excellent sixth, but there was disappointment for Nico Rosberg, who had been quickest in both Q1 and Q2 but could not maintain that pace as the track dried. He fell to seventh, with his team-mate Kazuki Nakajima ninth between Robert Kubica (BMW) and Fernando Alonso (Renault). Before the Brazilian Grand Prix weekend, Formula One’s ringmaster Bernie Ecclestone has said he wanted to see the championship decided at the final round in Abu Dhabi. Well, following this lengthy qualifying session and with a grid line-up for Sunday, it seems that we could be heading that way. Sebastian Vettel dominated the Japanese Grand Prix from start to finish, even a late safety car period caused by Jaime Alguersuari’s big crash on the exit of 130R was unable to trouble the cool German in achieving his third victory of the season. By winning at Suzuka, Vettel and Red Bull Racing still have the opportunity to win the drivers’ championship, following a challenging race for Jenson Button and the Brawn GP team’s grid penalties. Jarno Trulli gave home team Toyota its second runner-up finish in a week by beating Lewis Hamilton’s McLaren to second, with the world champion just resisting Ferrari’s Kimi Raikkonen for third. Nico Rosberg finished fifth for Williams with fellow countryman Nick Heidfeld taking sixth for BMW Sauber. As for the Brawn GP pair, the championship battle between Rubens Barrichello and Jenson Button advances to the next race following a difficult Grand Prix. By finishing in seventh and eighth respectively, this was not enough to wrap up the constructors’ title and with only 14 points between the Brazilian and the Briton, the fight for top honours moves on to Sao Paulo in two weeks time. As the five red lights went out, Vettel managed to fend off the KERS-assisted Hamilton at the start. The Red Bull stuck to the racing line, while the McLaren was forced to take the outside route, but at least Lewis was ahead of Jarno Trulli. This trio pulled away from the rest of the field, with Nick Heidfeld’s BMW in a lonely fourth. At this point, Barrichello was trapped behind Raikkonen in sixth position. Button fell to P12 at the start, but managed to overtake Giancarlo Fisichella’s Ferrari further around the first lap and then outbraked Robert Kubica’s BMW at the chicane on lap three. The championship leader was then stuck behind the battling Mercedes-powered pair of Heikki Kovalainen and Adrian Sutil. Jenson needed to get by as soon as possible or risk losing ground to the top eight. Fortunately for Button, the McLaren and the Force India ahead tangled at the chicane on lap 13 as Kovalainen tried to fight back on the exit after losing the place under braking. While Sutil spun and Kovalainen lost momentum, Button cruised through to eighth – and the race continued to unfold in his favour through the middle stint. Rather than managing to jump Raikkonen and challenge for a podium, Barrichello stayed behind the Ferrari in the first stops and then lost ground on his second set of tyres, falling 15 seconds behind Raikkonen. The threat from the fast-closing Kubica behind was then neutralised when Heidfeld emerged from his final stop right in front of his team-mate, and by the time Kubica had got ahead after several laps of frantic efforts, he was too far adrift to steal the point from the Brawn. Up front, Vettel controlled the race with ease, while Hamilton looked to be secure in second, 2 to 3 seconds clear of Trulli, until the Toyota ran two laps further at the second stops and jumped ahead to claim the runner-up spot. Raikkonen charged up behind Heidfeld in the middle of the race and then vaulted the BMW Sauber for fourth in the pits, with Nico Rosberg then pushing his countryman back to sixth by running very long in his second stint. A huge crash for Jaime Alguersuari brought out the safety car with nine laps to go. The Scuderia Toro Rosso driver lost control of his car at the exit of 130R and slammed into the barriers at scarcely diminished speed. He climbed from the car unaided but was taken away on a stretcher for medical checks. His team-mate Sebastien Buemi retired early with a clutch problem. The appearance of the safety car allowed Nico Rosberg to stay ahead of both Brawns with his last pit stop. After the race Button claimed Rosberg had gained four seconds under the safety car, allowing him to stay ahead. If Rosberg got a standard 25-second penalty, it would give Brawn two more points and make them constructors’ champions. Vettel stormed away with ease in the final four-lap sprint, with Trulli safe in second as Hamilton held off Raikkonen despite KERS malfunctions. All eyes were on the championship contenders as Button mounted a final attack on Barrichello, but then Jenson was under huge pressure from Kubica instead. The Polish driver tried several attempts to get by but it did not pay off, and Button was able to take the remaining point with eighth. Fernando Alonso used a one-stop strategy to come through from the back of the grid to tenth for Renault, ahead of Kovalainen and Fisichella, who had a dramatic moment after their final pit stops. 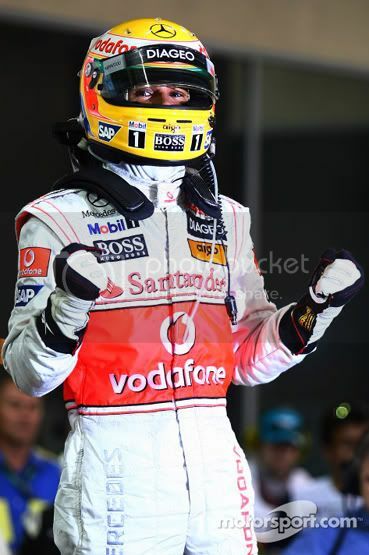 The Ferrari jumped ahead in the pits but the McLaren retaliated with a bold wheel-banging move into the first corner. While Vettel dominated, Mark Webber’s bad luck continued and after making three early pit stops – two to secure a loose headrest, and the third to attend to a puncture. Fastest lap showed what might have been for the Red Bull driver. Vettel’s stunning victory aside, the German’s hopes of winning the title may appear slim, especially given his engine situation, but Sebastian knows how Kimi Raikkonen won the title back in 2007 and will remember that anything is possible in Formula One. Next race: Brazilian Grand Prix, Interlagos. October 16-18. Sebastian Vettel took his fourth pole position this season in a chaotic Suzuka qualifying session that was interrupted by three red flags for massive crashes, one of which has left Timo Glock injured. The Red Bull Racing driver dominated the all-important Q3 session by setting the quickest time in all three segments around the challenging 3.62-mile race track. Vettel stopped the clocks at one minute, 32.160 seconds to earn his first pole since Silverstone, beating Jarno Trulli and Lewis Hamilton in the process. 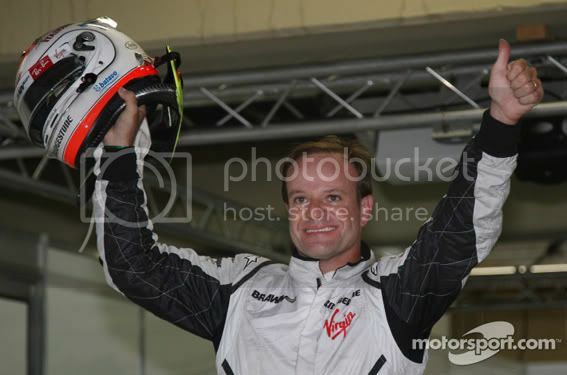 As for the championship contenders at the Brawn GP team, Rubens Barrichello has outqualified his team-mate Jenson Button with fifth and seventh respectively. However the pair could possibly face penalties after setting their best Q2 times while yellow flags were out. The first two red flags occurred in Q2 when Scuderia Toro Rosso driver Jaime Alguersuari crashed head-on into the tyre barriers after running wide at the tricky Degner corner. The Spaniard was assisted out of his broken car by track marshals and after a check-up with the Formula One medical team he is cleared to race. Toyota’s Timo Glock had a far larger shunt when accelerating out of the Casino Triangle chicane. The German seemed to understeered off the turn leading to the pit straight and directly into the tyre barrier. The medical team carefully extracted Glock, who was conscious and moving in the cockpit, and he was removed from the scene on a stretcher. The German waved to the crowd as he was placed into an ambulance and is being taken to hospital by helicopter with pain in his back and left leg. The Toyota team will decide on race day morning whether Glock is available to take part in the Japanese Grand Prix. If the German is out of action following this incident, Toyota will consider the use of Kamui Kobayashi. The Japanese driver has already replaced Glock in Friday’s wet practice sessions, when the German was feeling unwell. However, under the current Formula One regulations, Kobayashi would not be allowed to race unless he gets special dispensation from the sport’s governing body, the FIA. If not, then the sole remaining Toyota of Jarno Trulli will represent the team in its home Grand Prix. With the red flags having interrupted most drivers’ preparation for quick laps in Q2, there was a last minute sprint to get through into Q3. In that rush, Sebastien Buemi crashed on the exit of Spoon Curve and deposited his Toro Rosso’s front wing and other carbon fibre debris in the middle of the track as he limited back to the pits. Yellow flags were waved at this section of the circuit, and yet both Barrichello and Button set their fastest sector times to make it through into the top-ten shootout. Renault’s Fernando Alonso obeyed the warning by backing off (but had to overtake the slow Buemi even though overtaking is not allowed under yellow flags). The double world champion will start in a disappointing P12, with Nico Rosberg (Williams) and Robert Kubica (BMW Sauber) also knocked out. That Spoon Curve incident was Buemi’s second accident in qualifying, as he had already spun backwards into the Degner tyre wall in Q1. Luckily, he was able to return back to the pits and after fitting a new rear wing on his Toro Rosso, he was able to record a lap to go through into Q2. But in a bid to improve his time, the Swiss pushed too hard and it was trip into the barriers. The third red flag came out in Q3 when McLaren’s Heikki Kovalainen crashed at that demanding Degner Curve. The Finn had earlier spun at the tricky turn in Q1 without hitting anything. Unfortunately, the next time through on his first flying lap in Q3, he spun and hit the outside barrier. The Finn escaped unhurt but will join fellow shunt specialist Buemi on row five on the grid. Why was so many drivers flying off the track and crashing? The reason could be down to two big factors. The first is the limited running on the dry track, no thanks to a complete washout in Friday’s practice sessions. The second is that the drivers were taking more risks in a bid to set competitive lap times. Combining these two factors has resulted in a messy qualifying session with drivers pushing a bit too far in a car that hasn’t been properly set up for the figure of eight race circuit. Anyway, back to Q3 at Suzuka. With Kovalainen’s damaged car moved away, the session finally proceeded without any further drama to the chequered flag, with Vettel securing his pole position with just one flying lap. 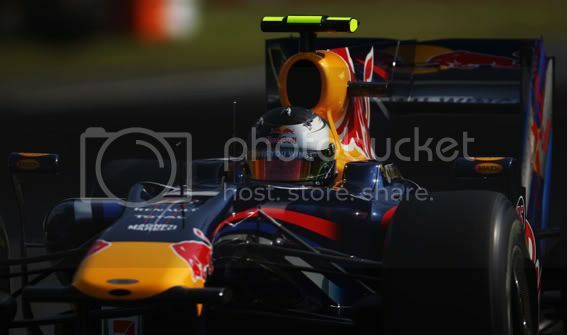 His Red Bull Racing team-mate Mark Webber missed out on the whole session after a crash in final free practice. Where did the Australian go off? Yes, it was that corner again… The team was unable to repair his RB5 so Webber will start the Japanese Grand Prix at the back of the grid in a new chassis. Behind Trulli and Singapore Grand Prix winner Hamilton, Force India’s Adrian Sutil grabbed fourth spot with BMW’s Nick Heidfeld splitting the Brawns in sixth position. Ferrari’s Kimi Raikkonen lines up eighth while team-mate Giancarlo Fisichella was within half a second of his team-mate’s pace in Q1, but that left him back in P16. It was a similar story for home driver Kazuki Nakajima, who only managed P17 for Williams. Renault’s Romain Grosjean and the Force India of Tonio Liuzzi were the other Q1 departures, with the latter set to take a gearbox change penalty, along with Webber. UPDATE: Revised line-up following penalties for five drivers for not backing off during a yellow flag period in Q2.